The documents released by WikiLeaks that purport to show how the CIA hacks into electronic devices are authentic – with Russia being eyed as the possible culprit behind the leak. A senior US official says that the WikiLeaks documents do contain authentic information about CIA hacking techniques, NBC News reported. The report also quotes US intelligence sources as saying that the Russian government is believed to be behind the revelations. Moscow, which has been blamed by the US for attempting to influence the results of the 2016 presidential election by hacking into Democratic Party computers, has been accused of having ties to WikiLeaks. Drone aircraft recently carried out unauthorized intrusions over Air Force and Navy nuclear facilities, and the incidents pose a growing threat, the commander of the U.S. Strategic Command disclosed to Congress Wednesday. Gen. John E. Hyten revealed the drone threats in written testimony before the House Armed Services Committee for a hearing on nuclear deterrence. The commander said protecting U.S. nuclear forces and facilities is a top priority. “We are continually assessing threats to ensure our security apparatus is capable of denying unauthorized access or use of nuclear weapons,” he said. Moscow (CNN) Russia rejects claims it has deployed a cruise missile in violation of the Intermediate-Range Nuclear Forces Treaty, Kremlin spokesman Dmitry Peskov told reporters Thursday. “Russia has been, remains and will remain committed to all international obligations, including those arising from the INF Treaty,” Peskov said. Peskov was responding to an allegation from Gen. Paul Selva, vice chairman of the US Joint Chiefs of Staff, in testimony Wednesday before the House Armed Services Committee. Israel is concerned that Islamic State terrorists facing defeat in the Middle East are planning to return to their home countries and carry out attacks there, including a possible chemical attack in Europe, Channel 2 TV news reported Thursday. The report said Israel’s Counter-Terrorism Bureau is poised to issue a series of travel warnings ahead of the Passover holidays calling on Israelis travelling to Western Europe, India and Thailand to exercise extreme caution. The report stressed that the warnings have not yet been issued. The European Union needs to be more visible in the western Balkans to counter Russian attempts to destabilise the region, a leading MEP has said, as EU leaders gather for a summit in Brussels on Thursday. “Geopolitics has returned to the Balkans,” said David McAllister, a German MEP and chair of the European parliament’s foreign affairs committee. “We are seeing the growing Russian influence, we are seeing growing Turkish influence, the United States is a player, the European Union is a player, so there are different interests at stake,” he said. But it was Russia’s role that he described as negative, citing the Kremlin’s suspected involvement in a failed coup in Montenegro and Moscow’s support forhardline nationalist leaders in the region. Russia was also exerting influence on political debate by organising anti-western, and anti-EU propaganda, McAllister said, especially in Serbian-language media outlets that promoted the Kremlin’s world view, as well as “conspiracy theories and Serbian ultranationalism”. Turkey’s accusations of “Nazi-style practices” in Germany cannot be tolerated and need to stop, Angela Merkel has said. In her strongest reaction so far, the German chancellor told parliament that comments by the Turkish president, Recep Tayyip Erdoğan, and other Turkish officials had saddened her “because comparisons with Nazi Germany always lead to misery, to the trivialisation of the crimes against humanity committed by national socialism”. Merkel described the comments as “misplaced” and “unjustifiable”, but also warned of the dangers of breaking off diplomatic relations with Turkey. “We want to live our basic values in the way we think it right”. The U.S. military is relying on zero-hour modernization to maintain its aging nuclear arsenal as an effective deterrent against adversaries, according to two top U.S. generals. Gen. Paul Selva, vice chairman of the Joint Chiefs of Staff, testified before the House Armed Services Committee that the United States cannot defer nuclear modernization without “significant risk” to its deterrent capabilities, particularly as other countries like Russia and China are working to revolutionize their forces. “These systems will not remain viable forever. In fact, we are now at a point where we must concurrently recapitalize each component of our nuclear deterrent,” Selva testified Wednesday. In the wake of WikiLeaks’ massive document dump belonging to the CIA, Washington is scrambling to figure out the source. Nathan Rousseau Smith (@fantasticmrnate) has the latest. WikiLeaks will allow tech companies access to much more detailed information about CIA hacking techniques so they can “develop fixes” before the information is widely published, WikiLeaks founder Julian Assange said Thursday. Assange spoke two days after WikiLeaks published thousands of documents it said revealed hacking tools the CIA developed to break into servers, smartphones, computers and TVs. The online news conference took place at the Embassy of Ecuador in London, where Assange has been holed up since seeking asylum in 2012. Assange said the website hasn’t published the tools themselves because it doesn’t want “journalists and people of the world, our sources, being hacked using these weapons.” He said some companies have approached The best way to avoid that, he said, is to give companies such as Apple, Google and Samsung access first. German Minister for Foreign Affairs Sigmar Gabriel, who is in Moscow for talks with his Russian counterpart Sergey Lavrov, says that Germany fears a new arms race in Europe. Russia and Germany should strive for disarmament in Europe, despite the likelihood of the resumption of the arms race, Gabriel said. WikiLeaks’ massive ‘Year Zero’ release on the CIA’s secret hacking techniques has revealed a covert listening post used by agents which may be named after Russian President Vladimir Putin. Listening posts are used to monitor devices, such as computers and phones, which have been hacked with the CIA’s malware implants. Malware is a malicious software used to disrupt or infiltrate computers and mobile devices. The ‘Pocket Putin’ listening posts are virtual and are stored on a CIA server. The posts named after the Russian leader are used by the Operational Support Branch (OSB) of the CIA, which acts as a middleman between CIA operational staff and the agency’s technical support staff. CIA case officers make requests to the OSB who then help turn those requests into hacking attacks on CIA targets. The Putin listening posts are stored on the OSB’s big server, known as the ESXi, which is used to deploy and service an array of virtual computers operated by the spy agency. While the documents don’t detail where the ‘Pocket Putins’ are used, or the content they collect, listening posts are used to monitor and communicate with malware which has already infected computers and other devices. 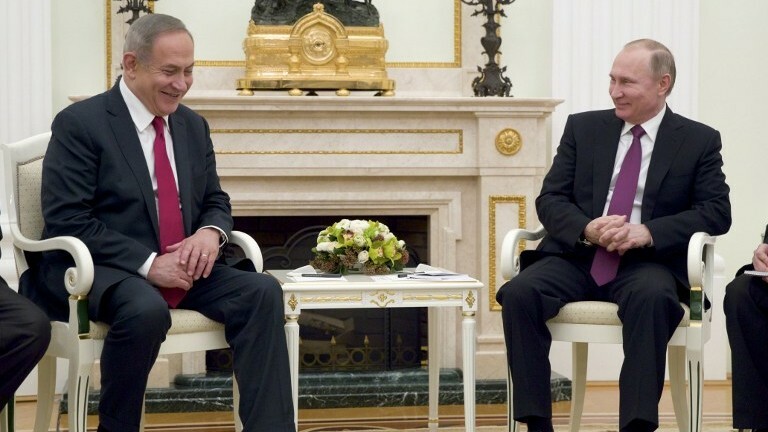 Raphael AhrenPrime Minister Benjamin Netanyahu said Thursday that his talks in Moscow with Russian President Vladimir Putin were focused on keeping Iran from filling the vacuum left by the Islamic State in Syria and combating Iranian-sponsored radical Islamic terrorism. “One of the things that we are fighting against together is radical Islamic terrorism. Of course, there was significant progress last year in the fight against the terrorism of radical Sunni Islam led by the Islamic State and al-Qaeda, and Russia has a very important contribution,” Netanyahu said ahead of his meeting with the Russian president. “It’s obvious that we wouldn’t want this terror to be replaced by radical Islamic Shiite terror led by Iran,” he said. While Russia has played a major role over the last year in Syria combating the Islamic State and the Syrian rebels, Israel is concerned that the Kremlin not allow Iran, Russia’s ally in supporting Syrian strongman Bashar Assad, a permanent foothold in the country. 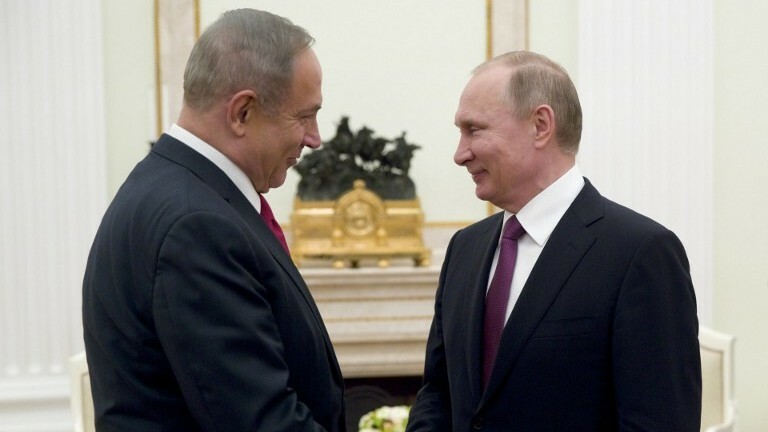 Later, at the Kremlin, Netanyahu thanked Putin for his wishes ahead of the Jewish festival of Purim, which starts Saturday night, noting that modern Iran now threatens the Jews as the ancient Persians did then. “Twenty-five hundred years ago in ancient Persia, there was an attempt to wipe out the Jewish nation that was unsuccessful, which is being marked with this holiday,” the prime minister said. “Here today in Persia’s successor, Iran, there is another attempt to wipe out the Jewish state. They say this as clearly as possible. They inscribe it on their ballistic missiles,” he said. Netanyahu said that Iran was a threat not just to Israel, but to the whole region. “Today, Israel is a state with an army and we are able to defend ourselves. But the threat of Shiite Islamic extremism is not just a threat to us, but rather to the entire region and world peace. I know that we share the desire to prevent any victory for radical Islam from any direction,” he said. During the meeting, Putin said he was “very pleased” with his “close and trusting contact” with Netanyahu. China Aerospace Science and Industry Corp (CASIC) plans to develop technology for long-endurance stealth drones, as well as complete the design of high-speed combat/reconnaissance drones, CASIC’s deputy general manager told the official China Daily. CASIC is also interested in developing near-space drones, which would travel in Earth’s atmosphere at altitudes of 20 to 100km, above the top altitudes of commercial airliners but below orbiting satellites.The company is already selling its UAVs on the international market. The most popular are CH family drones, which have been sold to 10 countries’ armed forces. The US is considering sending 1,000 American soldiers to Kuwait as a contingency force in the fight against the Islamic State in Iraq and Syria, Reuters reported Wednesday. According to the report, advocates of the plan say that it will grant US military commanders in the region the ability to respond swiftly to changes on the ground as groups backed by the US continue their advance on IS strongholds in Iraq and Syria. “This is about providing options,” an unnamed US official told Reuters. It is not known if US Secretary of Defense James Mattis, who in his final role in the military as head of US Central Command was in charge of US forces in the Middle East, is in favor of the plan or is considering alternative options to grant commanders on the ground greater flexibility. US officials who spoke with Reuters said the proposal is part of the review ordered by US President Donald Trump of the US military’s plans to defeat IS, which could include sending more ground troops to battle the terror group in Iraq and Syria. WASHINGTON — President Donald Trump has offered former Utah Gov. Jon Huntsman the position as U.S. ambassador to Russia, a high-profile and sensitive post amid investigations into contacts between Russian officials and the Trump campaign. Former Director of National Intelligence James Clapper told ABC News he did not see anything to suggest that Russia successfully infiltrated Donald Trump’s presidential campaign or recruited any of Trump’s advisers – at least as of Jan. 20, when the retired three-star general left office. The Clapper comments came amid a fight between the Trump administration and the FBI over the wiretapping claim the President made in a series of early morning tweets Saturday from his Palm Beach getaway, in which he accused former President Obama of wiretapping Trump Tower. The president compared it to the Watergate scandal but without backing that up with any explanation as to why he believes the eavesdropping occurred. “None at all…including the FBI,” he said. FBI Director James Comey asked the Trump Department of Justice — his supervisors — to publicly refute that claim, a senior official told ABC News. Comey felt Trump’s allegation had impugned the FBI’s reputation by suggesting agents conducted illegal or politically-motivated surveillance. But the Justice Department has remained silent this week, leaving Comey, a Republican career law enforcement official appointed by Obama to a 10-year term, in an ethical bind. Two weeks ago, White House Chief of Staff Reince Priebus asked the FBI to do something similar, to publicly refute the months’ of stories suggesting collusion between the Kremlin’s agents and Trump campaign operatives, but Comey had refused, White House aides acknowledged. Russia may start producing Sukhoi T-50 air superiority jets en masse after 2018, a deputy defense minister said. KOMSOMOLSK-ON-AMUR (Sputnik) — The Russian Defense Ministry will consider the issue of Sukhoi T-50 (PAK FA) fifth-generation fighter aircraft procurement under the new state armament program for 2018-2025, Russian Deputy Defense Minister Yury Borisov said on Thursday. “The aircraft is undergoing scheduled tests,” Borisov told reporters. He added that Komsomolsk-on-Amur aircraft manufacturing plant would continue to supply prototypes of the aircraft for testing. “Three new aircraft, which the company will deliver in 2017, will join the first stage of the testing program,” the official pointed out. The T-50 is designed by the Russian Sukhoi aircraft manufacturer as part of the PAK FA, a fifth-generation fighter program of the Russian Aerospace Forces. It is a single-seat, twin-engine multirole fighter jet designed for air superiority and attack roles and equipped with advanced avionics system and an active phased array airborne radar. The first flight of the aircraft took place in 2010. The U.S. and Russia have found themselves teaming up for the first time in the war in Syria — against a country both call an ally: Turkey. The U.S. and Russia moved this week to block a threatened drive by Turkey to seize Manbij, a town in northern Syria about 40 kilometers (25 miles) from the Turkish border. A U.S. deployment and a Russian-brokered deal with Syrian forces created buffer zones that headed off any Turkish campaign against the Kurdish forces who hold the town — seen by Washington as key allies against Islamic State and by Turkey as terrorists. As the outside powers fighting in Syria step up the fight to crush Islamic State, the battle is laying bare their often-conflicting loyalties. With all sides pushing into terrorist-held territory, the potential for clashes between the players is rising. Russian President Vladimir Putin is a central player thanks to his military campaign, but he must keep allies like Syria and Iran on his side even as tries to cooperate with the U.S. and Turkey. Turkish President Recep Tayyip Erdogan comes to Moscow on Thursday with his defense minister for talks with Putin. “This is a unique circumstance when the U.S. and Russia have found themselves thrown together against Turkey because of the Kurds, who are directly sponsored by Washington and get Russian support too,” said Alexander Shumilin, head of the Middle East Conflict Center at the Institute for U.S. and Canada Studies, a government-run research group in Moscow. Sven Mikser’s comments to the ‘Post’ come just ahead of Netanyahu-Putin meeting in Moscow. Estonia stands with Israel on security issues, including opposing Russia’s role in supporting both Syrian President Bashar Assad and Iran’s military presence there, its Foreign Minister Sven Mikser told The Jerusalem Post. “The role that the Russians play [in Syria] by way of trying to keep Assad in power and by the apparent collusion with the Iranians, yes, that is a shared concern,” Mikser said. He arrived Tuesday night for a two-day trip and met Wednesday with Prime Minister Benjamin Netanyahu. On Thursday the Israeli leader flew to Moscow to talk with Russian President Vladimir Putin about the importance of halting Iranian activities in Syria. The small former Soviet bloc country that borders Russia has a population of only some 1.3 million people and a long history of resisting Russian expansionist drives. “We can say with some confidence that they [Russia] will not shy away from using military force to achieve political aims,” Mikser told The Jerusalem Post during a Wednesday interview in Jerusalem. Is Christianity in the Middle East coming to an end? The U.S. ambassador to the United Nations endorsed the UN’s peace process for Syria and said one U.S. goal in the negotiations will be to “get Iran and their proxies” out of Syria. “The United States absolutely supports [UN Syria envoy] Staffan de Mistura and the work that he’s doing, we support the UN process, we support the talks in Geneva, we want to see them continue,” Ambassador Nikki Haley said after Mistura briefed the UN Security Council in New York on progress during 10 days of talks in Geneva that ended last week. Iran, one of Syrian President Bashar al-Assad’s main allies, has provided advisers to the Syrian Army as well as Iranian militia fighters, hundreds of whom have died during the six-year civil war. Iran also backs fighters in Syria from the Lebanese Shi’ite Muslim group Hizballah, which the United States has labelled as a terrorist group. Since U.S. President Donald Trump took office in January, he has made it clear that he intends to get tough on Iran but his policy on Syria has been unclear and slow to emerge. Israeli Prime Minister Benjamin Netanyahu is in Russia for talks with President Vladimir Putin. The conflict in Syria is likely to top the agenda. But the Israelis are also concerned about Iran and Hezbollah’s expanding ground operations in the Golan Heights, which Tel Aviv considers a major security threat. Russia’s leadership will also receive official visits by the leaders of Turkey, and Germany. Russian President Vladimir Putin and Israeli leader Benjamin Netanyahu are scheduled to meet to discuss “joint efforts against international terrorism” and “key aspects of the Palestinian-Israeli settlement,” according to a Kremlin statement. Meanwhile, Russian Foreign Minister Sergei Lavrov is expected to meet with his German counterpart, Sigmar Gabriel, particularly to discuss the simmering conflict in Ukraine. Gabriel and Putin might also meet later in the day. Turkish President Recep Tayyip Erdogan is also expected to arrive in Moscow on Thursday, according to announcements by Turkish officials, but his scheduled meeting on bilateral relations with Putin will be on Friday, the Kremlin said in a statement. Putin and Erdogan are expected to discuss the conflict in Syria, as well as construction of the Turkish Stream gas pipeline and the Akkuyu Nuclear Power Plant, the Kremlin said. A Pakistani man accused of spying for Iran went on trial in Germany Wednesday, for allegedly searching out potential Israeli attack targets for the Revolutionary Guards. The accused, named only as 31-year-old Haidar Syed M., remained silent — “out of fear,” according to his defense lawyer. He is accused of espionage “against Germany and another NATO member,” France, for the Quds Force, the foreign operations wing of the elite Revolutionary Guards. Prosecutors charged he had compiled dossiers on possible attack targets — a German lawmaker who is the former head of a German-Israeli organization, and a French-Israeli professor of economics. Investigators found detailed dossiers on the men and their daily routines, with hundreds of photos and video clips, the Berlin court was told. Those documents allegedly detailed the targets’ homes and work places, various access routes to them, as well as information on security guards, surveillance cameras and nearby police stations. A representative of Germany’s domestic intelligence service, which handles counterespionage, said it was alerted to M. by a “reliable” source. Two suicide bombers have blown themselves up, killing 26 people, as wedding guests gathered in a village near the Iraqi city of Tikrit. So-called Islamic State said two of its fighters had carried out the attack in the village of Hajaj on Wednesday. The first detonated an explosive vest among men who were dancing, then a second bomber targeted those who had gathered to help, officials said. Most of the dead were children, a local government spokesman told AP. IS said it had targeted a gathering of the Popular Mobilization Forces, a coalition of mostly Shia paramilitaries backed by Iran. In a post on its channels on the messaging app Telegram, IS said the attackers had clashed with members of the group before detonating their explosives. This photo provided by Mail Online on January 28, 2017 shows Abu Abdel Rahman, a Saudi national and Daesh militant, who was reportedly killed in the northern Iraqi city of Mosul. Iraqi intelligence sources say that most of the Daesh terrorists remaining in Iraq are Saudi nationals. “The Saudi presence in Daesh is very large. What we have left are mainly Iraqis and Saudis,” a senior Iraqi counterterrorism intelligence officer was quoted by Fox News as saying on Wednesday. Speaking on condition of anonymity, the official noted that around 30 percent of the Daesh terrorists in Iraq are Saudis that have entered the country over the past three years via Turkey or through the Syrian border town of Abu Kamal. “The Saudis make up a large number of suicide bombers, as they already have the ground work of radicalization installed in their minds from radical sheikhs in Saudi,” he added. Another Iraqi intelligence source noted that Wahhabism has lead to the creation of Takfiri terrorist groups like Daesh. “They have high-ranking officials and fighters among their ranks. Saudi Arabia is nothing without US protection,” he added. Mercy Corps, a leading American charity that uses Turkey as a base to aid hundreds of thousands of civilians upended by the war in neighboring Syria, was forced to curtail its work on Wednesday after the Turkish government abruptly revoked its registration to operate. “Our hearts are broken by this turn of events, which comes after five years of cooperation with the government of Turkey and other local partners,” Mercy Corps said in a statement. Michael Flynn, who was fired from President Donald Trump’s national security team last month, has retroactively registered with the Justice Department for work he did that may have benefited the government of Turkey. His now-defunct firm, the Flynn Intel Group, notified the government on Wednesday that it had done work for Inovo BV, a privately owned consulting firm in the Netherlands run by Turkish businessman Kamil Alptekin, beginning in August 2016. From August through mid-November, the Flynn Intel Group received $530,000 from Inovo, according to the forms filed with the Justice Department. Flynn shut down his firm in November. The firm then sub-contracted with S.G.R. LLC Government Relations and Lobbying — who also retroactively registered with the Justice Department this week — paying it $40,000. Disclosures also list Flynn’s firm paying out others, in “consultancy fees,” and for “administrative support,” videography and editing services. At the time, Flynn was a military adviser to the Trump campaign. Centrist Emmanuel Macron saw his position as favorite to win France’s presidential election boosted on Thursday in two polls, with one showing him ahead of far-right leader Marine Le Pen in the first round of the two-stage contest. A monthly Cevipof survey, seen as the most authoritative because it has a far bigger sample size than most polls, put Le Pen well ahead in the April 23 first round though Macron was seen easily beating her in a May 7 runoff. However, a Harris Interactive poll showed Macron winning the first round with 26 percent of votes, with Le Pen taking second place on 25 percent, setting him up to trounce her in the run-off with a score of 65 percent. There will be no UK-specific test and evaluation in relation to the Boeing P-8A Poseidon maritime patrol aircraft (MPA) being procured by the UK Royal Air Force (RAF) because the United Kingdom is buying the “same capability as the US”, a senior RAF officer told Jane’s on 8 March. “There are no current plans to develop any additional or bespoke UK capabilities,” said the officer, adding by way of example that “the P-8 that will come to the RAF will be able to use current and future sonobouys, such as the Multi-static Active Coherent [MAC] [capability], as standard”. The move must be carried out through an “inclusive and representative political process,” the statement added. The United States will send two B-52 strategic power projection bombers to South Korea in light of growing nuclear and missile threats coming from the North, local media reported on Tuesday, citing an official source. MOSCOW (Sputnik) — The strategic bombers are due to arrive at the US Osan Air Base located in the city of Pyeongtaek, 43 miles south of Seoul, this week, the source told the Yonhap News Agency. “They may stay at the US air base for several days for a possible unveiling to the public during the Osan base’s opening event this weekend,” the source said, as quoted by the media outlet. Earlier on Tuesday, the North Korean state media said that Pyongyang had successfully tested a high-power rocket engine, which would allow Pyongyang boost its capabilities at space exploration. WASHINGTON – The Islamic State group has lost almost all access to Iraqi oil, though the terrorist organization has thousands of fighters protecting its remaining oil-rich territory in Syria, a U.S. defense official said Wednesday. The official, who briefed reporters at the Pentagon on the condition of anonymity, said there are roughly 15,000 Islamic State fighters left in Iraq and Syria. About half of them are in or near Mosul or Raqqa, the terrorist group’s two remaining urban strongholds in Iraq and Syria, respectively. The remaining Islamic State fighters are concentrated along the Euphrates River Valley in eastern Syria, where the group is still able to extract and sell oil, the official said. STUTTGART, Germany — The U.S. Army is scouting locations in Germany for potentially basing more soldiers in Europe, where a post-Cold War period of military downsizing is undergoing a reappraisal. A team from U.S. Army Europe recently visited two military facilities in northern Germany, the Army said, a region without a current U.S. military presence. Joe Chen, CEO of Chinese social networking service Renren, first met SoFi CEO Mike Cagney in Palo Alto in 2011 and, over coffee, decided to invest in the fast-growth, disruptive online finance start-up. That initial $4 million investment helped SoFi get its start and led to two more financings within three years, with Renren contributing a major chunk of some $230 million raised. Fast-forward, and SoFi last month topped it off with a $500 million investment from private-equity powerhouse Silver Lake. SoFi is just the kind of deal that Chen has been pursuing: His NYSE-listed company, once known as the Facebook of China, has been investing in fast-growth tech start-ups to broaden its revenues and boost its stock price. That connection with Renren has also boosted SoFi. “Joe is a great investor and was our investor from the early days. He saw the vision early on and pushed us to grow faster and be more aggressive,” said Dan Macklin, a co-founder of SoFi in San Francisco. Similarly to Renren, China’s tech titans Baidu, Alibaba and Tencent are leading a surge of Chinese investment in cutting-edge U.S. technology start-ups with bold ambitions to expand their footprint, attract top talent and gain an edge in innovation. Collectively known as the BAT, China’s giant technology companies that dominate search, e-commerce and mobile messaging in their home market are going global. The United States is their primary shopping place to diversify and build out their brands. The hunt is on to acquire or buy into fast-growing young companies in a broad range of the hottest tech sectors, such as virtual reality, fintech, social media, video games and mobile apps. Their deals include such well-known American brands as image messaging app Snap, ride-sharing service Lyft and virtual reality player Magic Leap.